Kenrahn Level Regulator Starters are designed to control the level in Pits, Dams, Tanks, Sumps etc by automatically starting or stopping on level rise or fall using CR or CF level regulators. This method is particuarly reliable and positve switching gives accurate control in clean or dirty liquids, over wide or narrow switching points by using a level switch for each level. The standard unit is housed in a powder coated weather proof metal enclosure with all control switches and indicators behind a lockable door. High level Visual alarm/Strobe light. High level Audible alarm with or without mute button. switch is over a long distance or the wires are small. Transfer sytem for pumping from a pit or well to a distant Tank or Dam. No flow protection with by-pass timer to ensure the pump is operating. is primed and the pipe is not broken. Solenoid valve control for adding town water when level is low. Mutrator,Maserator, or Blower pump starter and controls. Plugs and sockets for ease of installation. 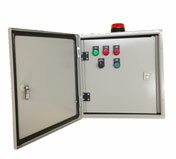 Aluminium or stainless steel enclosure for more arduous environments. Time clocks to restrict or permit certain pumping hours. Auto start time clocks to operate the pump during long non operating periods. Alarm contacts for activating a remote alarm or indicator panel. Rain Switch to prevent the pump from starting during wet periods. Moisture sensor control for the ground to prevent over watering. Over temperature protection using thermistors or Klixon style temperature switches. Motor start capacitors for three wire 240 volt motors to manufacturers specification. Various starting methods, such as Direct on Line, Star Delta, Soft Starter, Auto transformer or Variable speed drive can be supplied for any kilowatt motors in standard or economy models. Not all options are available on the economy models, please see the price list or check with Kenrahn before ordering.